7:30AM: Driver will pick you up at your hotel and depart to Sapa by bus, following Noi Bai - Lao Cai high-way. Along the way, you will have chance to admire the beauty of northwest mountains with terraced fields. Have a short break for 30 minutes en route. 12:30: Arrival Sapa, enjoy lunch at local restaurant then we embark on a lovely walking tour to the hill tribe village of Cat Cat, home of the H'Mong hill tribe minority people. As we walk to the villages nestled in the valley below Sapa we will meet some of the local minority people on their way to and from Sapa. Here we have the opportunity to share cultural experiences with families that live in the area. We embark on a lovely trek that will take us along buffalo paths and trails and through several hills tribe villages Lao Chai & Ta Van, home to Black H'mong, and Dzay people. This is an absolutely spectacular walk through stunning scenery inhabited by some of the friendliest people you can meet. Once on the valley floor you can really appreciate the wonderful scenery that surrounds you. 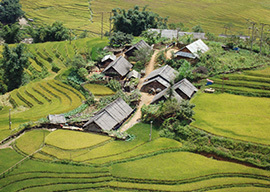 The walls of the valley are covered with multi-layered rice terraced fields and scattered villages. After visiting Ta Van the car will return you to Sapa. In the afternoon, driver takes you back to Hanoi. End of service!